Best Green Tea for Weight Loss - the extracts or the tea? The good news is that the best green tea for weight loss is the one you love because studies confirm that all green teas have ingredients that support weight loss! And the support is significant. The difference in green teas is minimal as far as the way in which they help you to lose fat. However, there is a difference between consuming the green tea extracts and drinking the tea. Neither the teas nor the green tea extracts are a lose-weight- quick-diet fix by any means. Green tea is a fantastically good beverage that supports healthy weight loss in a gradual way. The extracts will give you more concentrated effect without all the other wonderful qualities of drinking green tea. The best green tea for weight loss, the one you like, is a remarkable health promoting beverage that has some caffeine and thus some thermogenic, fat burning ability. But it's more than just the caffeine. It also, very significantly for weight loss, contains powerful antioxidants, most notably EGCg, an antioxidant polyphenol called epigallocatechine which protects you from disease and helps to reduce fat. Many studies have been done demonstrating that the best green tea for weight loss assists you in burning calories and sending glucose to the muscles where it can be used for energy. It also lowers the production of fatty acids which means it reduces fat cells. Western scientists are still studying all the different mechanisms by which green tea supports weight loss. This is something that the Chinese have believed for a very long time. Many of the studies have been done using the green tea extracts which come in a pill form and contain the antioxidant polyphenols that are in tea. One pill will equal about 5 cups of tea. A team of Swiss researchers reported in Molecular Nutrition and Food Research their very positive conclusions in regards to many lab and animal studies that showed that green tea and green tea catechins (the extracted antioxidants in concentrated form) reduce fat cells, prevent new fat cells from developing, reduce body weight and fat absorption, free fatty acids, triglycerides, cholesterol and insulin. There is definitely the evidence for both tea and the extracts. Green tea has all of the wonderful energizing qualities of coffee without the downside of too much caffeine and acid. Green tea only has about 42 mg. of caffeine while a cup of coffee will have about 90 mg. There are many wonderful green teas on the market and all are beneficial for those of us wanting to stabilize our blood sugar and manage our weight. The best green tea for weight loss will be the one you really enjoy. My very favorite green tea is Jasmine which has an amazing floral scent and flavor. I have found that if you buy it in leaves rather than bags it is much fresher and the flavor is best. There is no question that green tea has substantial health benefits. It has been used medicinally by the Chinese for thousands of years. It contains powerful antioxidants and is used as a cancer preventive and also prevents cholesterol and heart disease. The Chinese believe in drinking tea to support the digestive forces. The best green tea for weight loss could be the green tea extract which will give you more of the fat reduction benefits in a concentrated form or it could be the enjoyable daily ritual of drinking tea. Either way you will experience better health and better weight management but if you are looking for stronger weight loss results go with the extracts. Many people notice that the best green tea for weight loss which you drink as a beverage suppresses the appetite, improves digestion and gives you that morning happy, high feeling. There's just nothing like having a cup of hot green tea in the morning with a bit of stevia or a teaspoon of coconut sugar and 1/4 teaspoon of cinnamon. * 1 Nagao T, Komine Y, Soga S, et al. 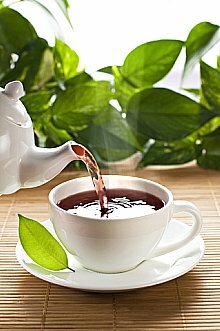 Ingestion of a tea rich in catechins leads to a reduction in body fat and malondialdehyde-modified LDL in men. American Journal of Clinical Nutrition 2005;81(1):122-9. All you need is a natural high, right? Return from Best Green Tea for Weight Loss to Slow Metabolism. Return from Best Green Tea for Weight Loss to Lifetime Fat Loss home page.